Monogrammist IS with the Shovel, , Georg Pencz, Hans Schäufelein, Virgil Solis, Monogrammist W.S. (Wolfgang Stuber?). Daniel Hopfer (b. Kauffbeuren c. 1470-1536 Augsburg). Hopfer's became a citizen of Augsburg in 1493 and was added to the roster of painters; he married in 1497 and had two sons, Hieronymous (Jerome) and Lambert, both of whom also became artists. Daniel began as an etcher of armor and was one of the first (if not the first) to make etchings on paper using thin sheets of iron alloy that did not rust so much as the iron Dürer would later use. The Crucifixion (B. 14 ii/ii). Original etching. Ours is a beautiful impression of the second state printed on wove paper with the Funck number trimmed away. Lifetime impressions tend to be less contrasty; this late impression is quite strong. The border line above the added text is just barely visible at bottom. Hopfer and his sons claimed to be the first to make etchings and taught Dürer how to make etchings. Image size: 328x216mm. Price: $2850. Appearances to the contrary, the print is rectangular. Hieronymous (Jerome) Hopfer (Augsburg, fl. 1510-1530), The Satyr and his Family (B. 33 ii/ii). 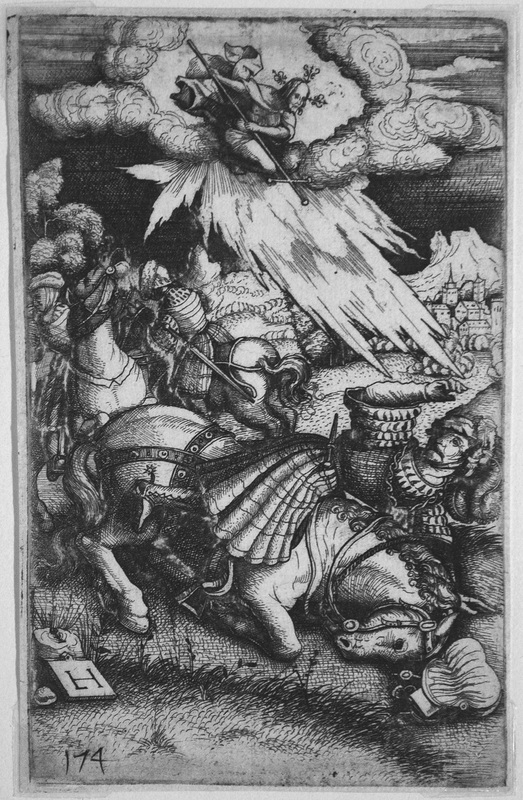 Etching after Durer's 1505 engraving of the same title (B. 91, S. 43). Heller notes copies by Hieronymous Hopfer, Wierix, and 4 others, attesting to the popularity of this image. 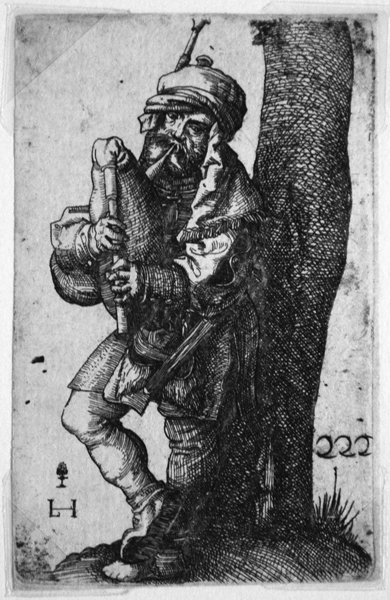 The Hopfer brothers were pioneers in the technique of etching and Dürer apparently learned the technique from them, though he only made 6 etchings himself. Ours is a good impression on laid paper inscribed in the plate with Hopfer's IH monogram hanging from the tree upper right. Ours is a 17th-century impression with the Funck number 161 bottom center-right. Image size: 139x86mm. Price: $2250..
Lambert Hopfer (Augsburg, fl. 1520-1530), The Conversion of St. Paul (B. 21 ii/ii). Original etching. The Hopfer brothers were pioneers in the technique of etching and Dürer apparently learned the technique from them, though he only made 6 etchings himself. Ours is a good impression on laid paper inscribed in the plate with Hopfer's IH monogram lower left. Ours is a 17th-century impression with the Funck number 174 bottom left. Image size: 140x88mm. Price: $2750. Bartsch gives larger dimensions, but our impression exactly matches the photo in the Illustrated Bartsch. Lambert Hopfer (Augsburg, fl. 1520-1530), The Bagpaper (B. 24ii/ii). 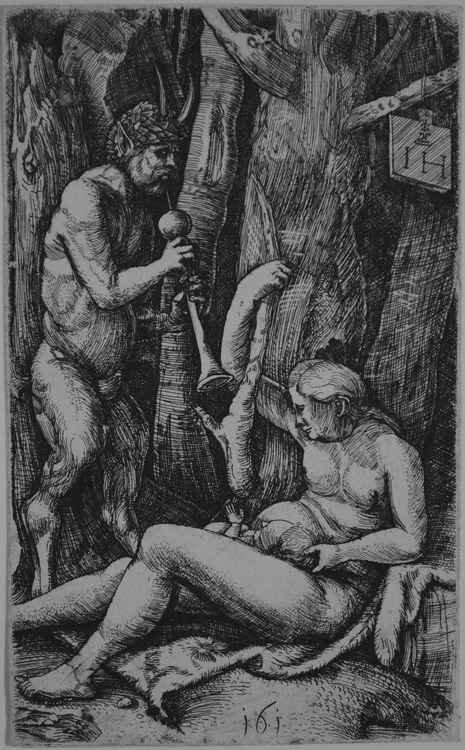 Etching after Durer's engraving of the same title (B. 91, S. 76). Heller notes copies by Lambert Hopfer, Wierix, and 14 others, attesting to the popularity of this image. 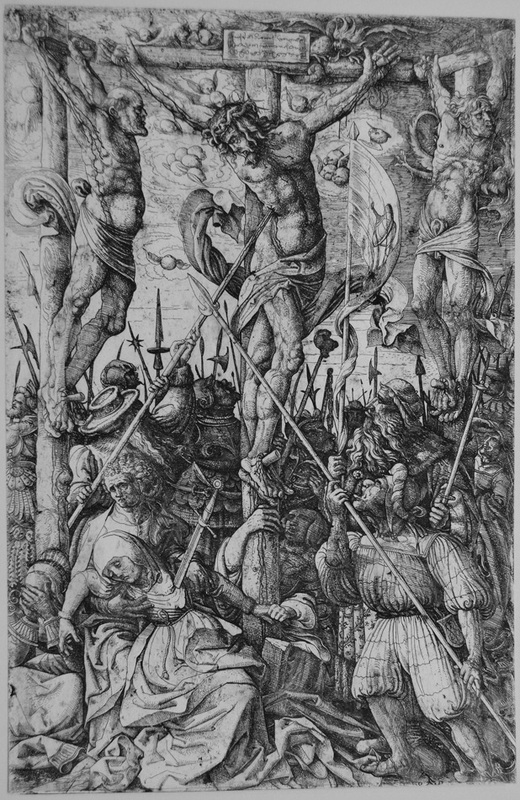 The Hopfer family were pioneers in the technique of etching and Dürer apparently learned the technique from them, though he only made 6 etchings himself. Ours is a good impression on laid paper inscribed in the plate with Hopfer's intertwined LH monogram. Ours is a 17th-century impression with the Funck number 222 lower right. Image size: 78x50mm. Price: SOLD.